This post has been removed by the member who posted it. Jerry thank you. But who are these individuals? Here's a shot of what came out of the kitchen on Saturday. From the salad dressings to the biscuits to the desserts, everything was homemade! Yeah, I'm with Bob: what are their handles here at aw.org? The food sounds fantastic. 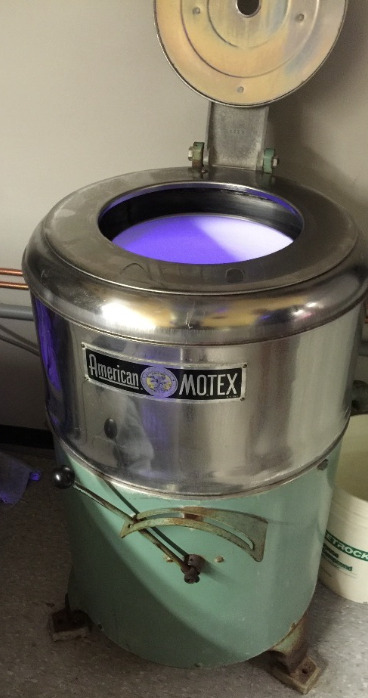 And I love that baby Whirlpool with the almost the same logo on the front as my '48 Kenmore. That has a much nicer winged agitator cap than my plain Kenmore one, lol. Reply #1; photo #6: Is that top-loading horizontal axis machine a Staber? Thanks for all the photos, Jerry. Reply #3: Good heavens, what a menu! Yep, that's a Staber. I think Jeff & Cal had just gotten that when I was there in 2002. Unbelievable fun and food for all! Looks amazing !! Is this a basement or separate out side building ! Oh to have that much space never mind those machines ! Looks great guys !! For the "2016 Convention Picture Thread" there are NOT very many photos! PLEASE POST MORE PHOTOS (and don't forget to list the names of people in the photos)! Kevin and others, I have scads of them I will be posting, I just got back to MN and I am paying for my vacation at work now! I will get them up here soon! Thank you Phil, I look forward to seeing them! Thanks for all the pics washoholic! I'd forgotten all about these laundromat extractors. Thanks Martin (and Jeff). I recall a friend's mom used to load up several of those old bolt-down, no-safety-switch Westinghouse Laundromats, then put everything into the extractor. I could lift the lid just a hair and get a glance at the super-fast spin. I'm sure it pulled a lot of water out of the loads washed in the Westys. What was their spin speed; around 300 rpm, maybe? And now I have a washer that spins at 1400---almost three times as fast as the 1960 Kenmore I grew up with. Eugene, not sure if Martin made a typo there but Jeff's extractor calculates at near 850 G's at full RPM. The spin basket radius is a bit smaller then a modern FL basket but it spins at as much as ~800 RPM higher. Since rotational G-force increases at the square of the speed, increases in RPM make more difference then cylinder size. A modern FL machine will be in the 400-600 range by comparison. I was unable to see the agitator on that lovely Blackstone does it have fins like others or did it use some other method? Ozzie, this is the pic you're talking about. First of all, So many thanks to Jeff Washaholic for getting shots of these gems. Spent a lot of time with him, and he just loves washers sooo baaadd, and he has a southern lilt to his speech that sometimes actually coos when he speaks. Delightful. So here's the deal: that is indeed the Blackstone agitator which is covered by the infamous red petticoat. In fact, it was one of the agitators featured in the test at Cal's and Jeff's. The red petticoat was manufactured to create a delicate cycle of sorts for those early Blackstones before two speeds came of age. The petticoat shields most of the agitator leaving only l about and inch or so of the fins to do the work; it's quite an incredible little invention when you think about it. And for more insider dope, that agitator was number six in the test and was located inside the unbelievable outdoor bedroom and kales and Jeff's Garden. Moreover, I couldn't remember what the agitator covering was called, and since the test allowed you to have help if you admitted it on the answer sheet which would only give partial credit therefore for that answer, so sweet Jeff told me what it was. ...in Cals' and Jeff's garden bedroom, the bedroom with the ice-cold AC from heaven which was offered to all for cooling and refuge from the outdoor heat and humidity. Soooo many appliances... So little time. Thank you for taking the pics. Thanks for all the pictures guys! I'm so sorry I was unable to attend, family obligations. There quite a few new appliances since I was there. I look forward in revisiting it soon. We got back to the wilds of St-Liboire later than anticipated due to some kind of system snafu with the customs systems at the Montreal airport and by the time we got in and had a bite to eat, we were wiped out. But here are some photos I managed to get. This group was taken on Saturday afternoon before the big event at the warehouse. A bunch of us (Yogitunes - Martin, Jamman_98 - Joe, Moparwash - Jerry are shown in the photo). Joe found that minty Snoopy Sno-Cone maker, but I found a couple o'goodies myself. Not shown are a mission-style tiffany lamp shade and a record that I swear I have been looking for over 20 years. Thrifting excursions on these wash-ins can be great fun - it's always neat to see what turns up in other states! I'm not sure if this is the best place to post or if it should go over on Super, but here's a condensed version of our cooking day on Saturday. Also, many shots of the warehouse. Thanks, John, for putting together such a great kitchen with so many wonderful old ranges! Having Hans, Ron, Donald and Ralph in the kitchen was as much fun as anyone should be allowed! A great weekend and thanks again to all our hosts!!! In the second picture, the caption should read "No bloody way you are doing THIS in the garage in Ogden"
In the third picture, he's getting grilled by Jon, Greg, Steve and Mike. Here's some pictures from the Sunday Brunch. Can't wait until the next one!! Jason and John L., awesome hosts of their amazing new piece of history! So happy to meet both of them. This Dispensall looks so much happier now too! that can never be put into words.....you have to experience it for yourself! Thanks for all the photos, Paul! Glad to see that Hans, Kevin, and the rest of the kitchen crew had Sunday off. Only had time to watch 7 minutes of the footage Ralph shot. Will get to the rest of it tonight. Hans's Southern accent takes the checkered flag! PLEASE tell me someone got a snap of Jeff, Phil, and John L. together and will post it. Jeff and Cal, your house is to die for. So is the warehouse/museum. Awesome, awesome, awesome. Well, David and I had a great time meeting everybody and like many others here: a big thank you to so many people: John L, Jeff & Cal, Jon Charles and Jason and Sherwin who work for John. It was great to finally meet so many others such as Robert, Greg, Paul & Chris from Canada, MikeyD and many others. And of course catch up with our friends Nathan & Michael from Australia too! I also have a personal thank you to a couple of members whom I'm taking back to Australia some machines and other appliances: Ben from Iowa, Don ( Jetaction) Kevin in LA, Tomturbomatic, Jon Charles and of course John L for my brand new Speed Queens! Echoing the appreciation and love for everyone from the planners and hosts to the great friends old and new. It was a whirlwind of good times and laughs, as always far too short. I didn't remember to keep taking pictures but I got a few. Tom (tomturbomatic) met me at Roosevelt National Airport Thursday afternoon and we took the Metro to Greenbelt station together. Great to spend time with him and catch up again. Dinner at Swahili Village that evening with hosts and some of the invaluable help at John's that day. Friday, we washed chairs and agitators at Jeff & Cal's and set them up seminar style to dry out while we made a trip to the Air & Space museum at Dulles Airport. I only took two pictures at the party Saturday night, capturing some the appliance-joy in Jon and Leon's faces was the best of the evening anyway! Sunday, Cal & Jeff gave us a tour of Greenbelt, a New Deal planned community - so much to see in the D.C. area, and it's all fascinating! Leon - enjoy your Unimatic and the Digital Maytag! Well had I known MickeyD was gonna be there I would have moved heaven and earth to attend. I only went because I heard you were going and cried the whole time when you didn't show up. Looks like everyone had a great time, and I'm sure no one went hungry! I would have liked to have attended, but just wasn't possible at this time. I wish I had been able to attend too. Great to see some old friends and some new faces and lots of great appliances. The museum was already great, but has been improved wonderfully. Great food too, I might have gained some weight! And goodness, in Jeff and Cal's basement there are still some of the same washers as in 2002! They have been well cared for! Keep the pictures coming, I'm enjoying them very much! It was certainly an event I know we would all look forward to again and again! I always am amazed every time I am there...its like entering Willie Wonka's Chocolate Factory! It costs alot of not just money but labor to put something like that on for so many people and the attendees to make it a success do even more after just geting there. I wished it was closer, I would have been there. Enjoyed all the pictures and hope everyone is home and safe. Well gentlemen it looks like a great time was had by all. A big thank you to everyone who managed to take pics and take the time to post what they saw. For those of us unable to attend it's like taking a walk into a fantasyland that we can only dream about. Some are still posting so for those we can't wait to see them. If anyone else has any videos that would be great also. Take care guys and be well! Just curious about something. What ensures that the museum stays around? Is there anything in place to make sure it won't just get wiped out when the last person that is taking care of it is gone? Awesome! Fabulous! All of it! The nostalgia, the appliances, the cooking!! Like one of the best Cavalcade of food episodes ever. My sister was in one, but doesn't recall which. How can you use so many ovens, ranges, and dishwasher at the same time? Isn't the maximum residential amps about 200 @ 240 volts? How many electrical panels in your house? Each cooking appliance uses at least 20 amps. At least one younger person who likes vintage appliances will come along and carry on. Maybe the appliances will be auctioned off down the road at some point. Hi Everyone ... Ralph and I sincerely thank Cal, Jeff, John, Jason for organizing and being such gracious hosts for the event. And, heaps of compliments to Hans, Donald, Ron, Kevin, and Ralph for the wonderful food. We had a fantastic time. Here are some pictures from Friday Evening. Thanks you guys, for these photos. I am loving seeing everyone enjoying themselves and learning about the event. Amazing what a photo can do. I always like when people with similar interests and fascinations can be together and truly have a good time. Kudos to the hosts, whom from what I can deduce did a wonderful job in the planning and execution of the conference. Looks like a grand time was had by all, the appliance showrooms look fantastic and to have a fully functioning kitchen manned with the best of cooks is a win win situation, congratulations to all involved in the many hours of preparation, dedication indeed. Oh Leon, how big is that container ? ha ha..Enjoy the rest of your holiday and look forward to more pics and names behind the faces !! I hope the photos of that load of dishes in the Frigidaire top loading portable were after the machine had been run and unloading of the load is being done. Otherwise shame shame rinsed dishes. I knew I should have been there to supervise BobLoading of dishwashers and doing the majority myself. But health and work demands prevented that. "I have been with Bob when he has Bobloaded® other peoples dishwashers. Its an art, like Japanese Oragami for dishwashers, not a speck of space available!" That attended and to everyone that helped pull this event off. And to everyone that helped get us ready Thank You, My brothers partner Cal was planning this event since January, he took care of all the registrations payments etc. Cal laid out the whole lead up in a week by week plan with almost weekly reports to Jason and I. Around the beginning of June when it was becoming evident that I was not going to get the kitchen and the showroom done in time Cal drew up plans and got two contractors to build walls in the showroom and build out the kitchen floor cabinets and counter tops and cabinets. This also would not have happened without the advance help of many such as Mike Haller [ dishwashercrazy ] who made two separate drives all the way from Illinois and stayed a week both times helping Jason install plumbing and also lots of additional cleaning etc. And of coarse the guys that came from Michigan Kevin and Ralph and Hans and Donald and Ron that came from North Carolina to do an incredible job feeding everyone, Jason , myself and staff and friends are still enjoying this great food. We still have four refs and freezers still running at the warehouse. In all there were more than a dozen others that came early and stayed days afterwards to help in this fun endeavor, A BIG thank-you to everyone that helped and attended. Whats the future of the Museum, We hope to form a nonprofit board that will run and maintain it into the future. If there is anyone interested in possibility being board members let us know. We are not sure, at least a few years, but I am considering doing a few smaller events where we either rebuild some machines we have here and or have people bring some of there machines that need repairs and or rebuilding. In any event let us hear your ideas. I would be very interested in being a part of keeping your visions for the Museum alive, count me in as needed for a future board. I would also jump at the chance to work with you all on some machines, I think that would be a great way to have smaller get togethers and pass on the skills needed to keep the Museum going into the future. You get 29 points for the Artey picture !!! you with the Christmas tree is in the Phipps conservatory? What are the qualifications and expected duties? Id like to contribute to this anyway I can. I haven't snapped beans in years and years. Used to do them with my grandmother and help her can them. Looks like you guys did a great job, that's quite the production. Now that's putting that kitchen to good use!! Enjoy those green beans (they look great) throughout the winter! Canning is a nice tradition to keep alive. Way back when in rural Michigan there were community canning kitchens where people could come with their produce and jars and can together and share/exchange jars. Maybe hosting a canning day at the museum might be a fun way of using that incredible kitchen? I would love to mave some bread and butter pickles with you guys! Excellent use of the kitchen there! Say hi to Jason for me. I'll have to ring and have a chat at some stage. And just in case you're wondering: container is due at my place the week ending 18 November. That looks like it was so much fun! Wish we could have been there. Y'all really would have gotten a kick out Tony's Southern accent. We grew up only two counties apart and I was further south than he, but he has the drawl more than I. We were in New Orleans, our second home when this was going on. New Olans' Oh, I hear ya Greg. Was that during southern decadence? I've never been, but have heard it's a blast similar to Mardi Gras, which I've never been to either. My partner has never been either, and doesn't care to, excpet maybe for the cusine. He loves jumbalaya. NY city either. I was there once, in the 80's. My ex was so stingy, we didn't even see one show, but he had to see a Yankees game. Three days isn't much time either. We've got flyer miles building, and Hilton rewards. There is a Homewood Suites right in Midtown Manhattan. I'd like to visit the 9/11 memorial. I went to the trade center in 1985. He'd like to see the museum of natural history, and I'd like the Googenheim as well. Then go to Katz deli, etc., etc. Oh, am I planning something? You betcha! His job is so stressfull right now, he'll need a real break. The last time we were away long distance was in 2011. He has no interest in appliances of any vintage. It just wouldn't be right for me to attend a wash in or convention alone when we don't get that much fun time. Canning, it gives you a good feeling, I remember helping my Grandmother can beans,I still can beans, peaches, squash, corn and make pickles and make apple butter and jelly, but this year didn't get a darn thing done!! !Love the big All American canner! I am Happy :) you are putting that kitchen to good use! I wish I was able to come their - I would love to spend a day creating various dishes and enjoying! Yeah Mike, we were there for Southern Decadence...but unintentionally! We'd never heard of it. We had gone to PCB and just decided to head on over to NOLA before coming back home. I've never seen so many "interesting" people, and I've been there for Pride...also unintentionally...it just happens to fall on our anniversary! 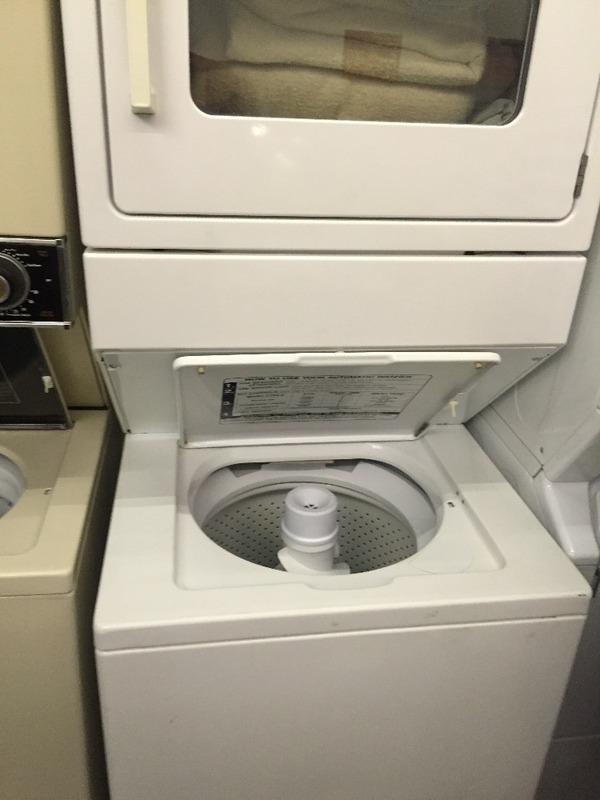 In one of the early postings it showed a kenmore dryer with a window. I have never seen one before. Is it canadian? The photo in reply #9? with the round window is a washer/dryer combo. Not a Lady K, maybe one of the last made. with the rectangular window is a Whirlpool, or an Inglis, not a Kenmore. Thank you!!! I didn't notice it was a combo. I have never seen that model. I serviced them for years for sears and never ran into one! It looks like a later year before they were discontinued. Thanks for the reply. My dad worked on at least 9 of them for three families in town who each had ten kids. They all had two in their laundry rooms.